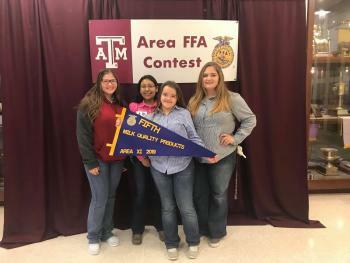 The Milk Quality Products Evaluation team from Hempstead FFA placed 5th at the Area 11 CDE competition held at Texas A&M University on Saturday, April 6, to qualify for state. Members of the team includeTeya Venegas, Jeany Mendoza, Krystal Sheridan and Hailey Oldham. Individually placing in the top 30% of the 49 competitors at area, Mendoza placed 12th and Oldham placed 13th. The team, coached by FFA Advisor Katie Crossley, will compete at Tarleton State University in Stephenville on April 25 for the State FFA CDE (Career Development Events) Competition. Good Luck at state Hempstead FFA!